Narrow Aisle Ltd has announced that its popular Flexi LITE articulated lift truck model is now available with an integrated four-stage ‘Quad’ lift mast. As its name suggests, the Flexi LITE was originally designed for applications where trucks have to weigh as little as possible – such as facilities where trucks are required to travel across loading bay dock plates into vehicles or to be moved in goods lifts between floors. But, with the addition of the ultra-low ‘Quad’ mast, the Flexi LITE has become highly suited to the task of stuffing and de-stuffing ISO containers. “The market for materials handling equipment that can unload and load pallets from and to ISO containers is already well established in the USA where virtually all FMCG products are carried in steel sided ‘semi trailers’ and it is growing in the UK,” says Narrow Aisle Ltd’s commercial director, John Maguire. He adds: “The Flexi LITE’s fast acceleration and travel speeds allied to its ability to enter containers safely make it an ideal product for use at sites where a high degree of ‘cross docking’ is undertaken. 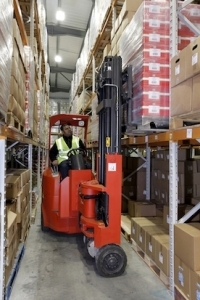 The Flexi LITE has a chassis width of just one metre and can operate in aisles as narrow as 1.8 metres. When fitted with a four-stage (quad) lift mast it can lift a palletised load weighing 1200kgs to 6 metres of heights. Part of the extensive range of Flexi articulated lift-truck technology based intralogistics solutions offered by Narrow Aisle Ltd, the Flexi LITE conforms to all European Stability and Security Standards and, like all Flexi models, is designed to work both inside and outside. Over 6000 Flexi trucks have been sold worldwide and aftersales back-up is provided in over 60 countries by Narrow Aisle’s extensive network of distribution partners. Welcome to the new online BITO Shop! Can logistics space meet the challenge of agility? Just how prepared for Black Friday are you? Is it really so hard to see why drivers are difficult to find?